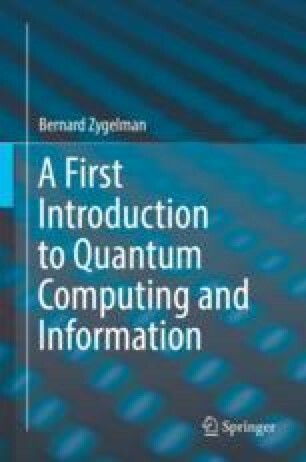 The concepts of bit and qubit, the fundamental units of information in classical and quantum computing respectively, are introduced. We discuss features of the binary number system, linear vector, and Hilbert spaces. We learn how to manipulate qubits and introduce Dirac’s bra-ket formalism to facilitate operations in Hilbert space. Scalar, direct and outer products of bra-kets in multi-qubit systems are introduced. We define Hermitian and unitary operators in a 2n-dimensional Hilbert space and use the bra-ket formalism to construct them. I summarize the foundational postulates of quantum mechanics, as espoused by the Copenhagen interpretation, for a finite set of qubits.